Soccer's rulemakers are adamant that the use of technology will go no further than the goal-line, yet there is an uncomfortable feeling another Thierry Henry-style handball controversy could trigger a whole new debate. Thursday's decision to allow the use of applied science to help the referee decide whether the ball has entered the goal or not, ended a decade of argument and came amid pressure from players, coaches and the media. Having given their approval, the International Football Association Board (IFAB), responsible for the laws of the game, and soccer's governing body FIFA insisted that any further forms of technology would not be considered. But they had said exactly the same thing about goal-line technology less than three years ago, only to perform an abrupt U-turn after Frank Lampard's infamous phantom goal for England against Germany at the 2010 World Cup. 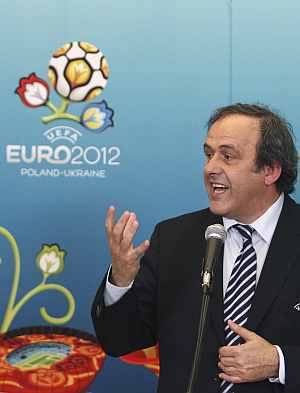 UEFA president Michel Platini is among those who fear that Thursday's ruling will open the floodgates for other forms of technology to be introduced. 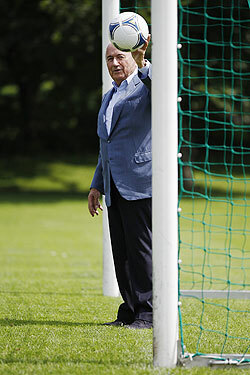 "I am not just wholly against goal-line technology, I am against technology itself because then it is going to invade every area of football," he warned last week. "Why don't we have technology for offside decisions as well? And what about Diego Maradona's 'Hand of God' goal in 1986? Why don't we have technology to see if Maradona handled it? Where does it stop? It won't stop. I am against technology itself." The number of cases where goals have been wrongly awarded or disallowed because officials have been unable to see whether or not the ball crossed the line is relatively small. Most injustices come from incorrectly awarded offside decisions and penalties or players who are either wrongly sent off or stay on the field when they should have been dismissed. Argentina may have benefited from the Hand of God in 1986 but they were on the wrong end of a similar decision at the Copa America nine years later when Brazilian Tulio clearly used his hand in scoring a late equaliser for a 2-2 draw. Brazil then won on penalties. Henry's infamous handball in the run-up to the goal which sent France to the 2010 World Cup at Ireland's expense would not have been avoided with goal line technology. Neither would the incident involving Dutch defender Ronaldo Koeman in a 1994 World Cup qualifier against England. Having been allowed to stay on the field despite denying David Platt a clear scoring chance, he then scored the first goal in the Netherlands' 2-0 win. On the same day that Lampard's effort was disallowed at the 2010 World Cup, Argentina beat Mexico 3-1 with the help of an opening goal from Carlos Tevez that replays showed was clearly offside. Ironically, the stadium screen exposed the mistake as it replayed the goal and the Mexican players surrounded the referee urging him to look at it. A similar incident in the future is bound to re-open the debate and spark demands for match officials to have access to video replays which are witnessed by millions of armchair fans. However, IFAB members were adamant this would not happen. 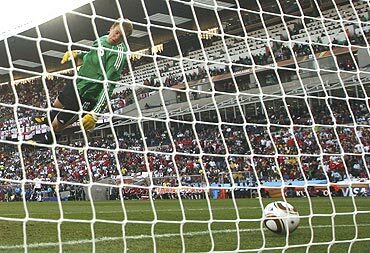 "Goal-line technology is where this starts and finishes for us," said Alex Horne, English FA general secretary and one of four representatives from the British associations on the board. While the two systems being introduced can inform the referee within one second of the incident, video replays would involve either having to stop the game or wait for a break in the action. Neither option is remotely satisfactory. Stopping play to study a penalty claim would deny the defending team, which might have fairly won the ball, the opportunity to launch a counter-attack of their own. On the other hand, allowing it to continue could force the referee to nullify two or three minutes of play, possibly involving further incidents. "The beauty of football in my mind is its fluidity and, of course, we would be removing that from the game which would be a great shame as far as I'm concerned," Welsh FA general secretary Jonathan Ford said. "There have been so many instances where play has gone straight down the other end of the pitch after a disallowed goal. When do you say stop?"